A conference room in an office is a room that can be used for meetings and other gatherings. For lack of better terms, a conference room is a space for people to confer. A conference room usually is set-up with a council table and seating for several people. The room is likely to be separated from the rest of the office with walls or dividers. Q. Who is the type of business that needs or can use a conference room? A. Most companies even a two person company may requirement a conference room to meet with clients for business presentations, sales seminars, or company training. Q. What is needed in layout / design (min measurementts)? Q. Where should I locate my conference room? Generally a conference room is located near the front door / reception area in order to keep visitors from having to walk through the entire office where sensitve material maybe located. Q. Why dedicate space to a conference room? Group meetings with internal staff or outside clients are vital areas to conduct business and to share ideas. Q. How can I find out more about a conference room? With a qualified architect or broker who can arrange a meeting to analyze your space requirements. The size of the space can be anywhere from a small meeting room to a larger board room. The configuration can be adjusted to suit any business requirements. The conference room or meeting room can be adjusted to the office with a more creative set-up or traditional business setting. Conference rooms can serve a variety of purposes such as, training rooms, interview rooms, workshops, or team meeting room. A conference room/meeting room is an amazing space to meet with clients. A conference room thoughtfully constructed and serviced could really put your office in the best light with clients. This space is a chance to impress clients and create the perfect image for your business. Furniture is a great way to create a practical and beautiful conference room. Brand name furniture such as, Vitra, Aeron Chairs, Rechteck, and Sauder in the conference room really make an impact. Conference rooms are specific spaces built to service meetings, collaboration, and celebratory events. There are several different types of conference rooms to fit any business and office space. Choosing the right conference room to best accommodate meeting attendants and coordinators is very important for any business. An office has many options including auditorium, boardroom, hollow square, casual meeting room, classroom and more. The different types of conference rooms offer many advantages and disadvantages to any office. Whether the office is creative or structured, conference rooms can be created to elevate the environment. An auditorium designed conference room benefits lecture or large meeting groups. The set-up is beneficial for minimal note-taking. The banquet style meeting room is used for lunch and smaller group meetings. There is typically a table to seat eight people comfortably. Boardrooms have a large table with chairs all around both sides and ends. Like the u-shaped design, the boardroom is favored by Board of Directors, committee, or discussion meetings. The classroom design is best suited for training and extensive note-taking. This design will also work for long lectures and larger group attendance. With a hollow design, the table and chairs are arranged in a rectangle with the center empty. This design works best with a moderate sized group meeting with around 40 attendants. The u-shaped design is designed to center the focus on a speaker, podium, or audio-visual presentation. This design is preferably used for Board of Directors, committee, or discussion meetings. What Type of Meeting Room is Right for Me? Presentation Rooms or standard meeting rooms are set-up with a large table either u-shaped or standard. These rooms typically hold a moderate group size. A presentation room is best suited for, you guessed it, presentations whether on overhead and pull-down projectors..
Conference Rooms are the most standard and common of the types. Conference rooms usually have enough chairs to comfortably seat everyone with a table varying in size. Some conference rooms have a stage or podium to feature the leader or speaker. Training Rooms have a different layout from the other types due to presence of individual stations or computer terminals. Training rooms bare resemblance to a classroom design to foster a learning environment. 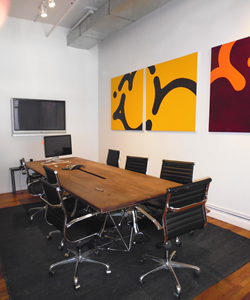 Boardrooms are designed with a large table and furnished with comfortable seating. The boardroom is favored by Board of Directors, committee, or discussion meetings.! Interview Rooms are a more private type of meeting space in the office. Many businesses prefer to have a more person-to-person environment to conduct interviews. With so many enticing options, there is a meeting space available that will check all your boxes. A conference room is a phenomenal addition for a company to promote collaboration and synergy. 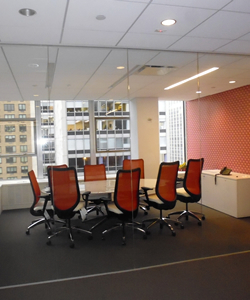 With many layout options, a conference room can work in favor of the company’s environment. A dedicated space for meetings and teamwork is vital for creative and idea brainstorming. As tenant brokers, we specialize in finding the perfect commercial space where your innovation can thrive.